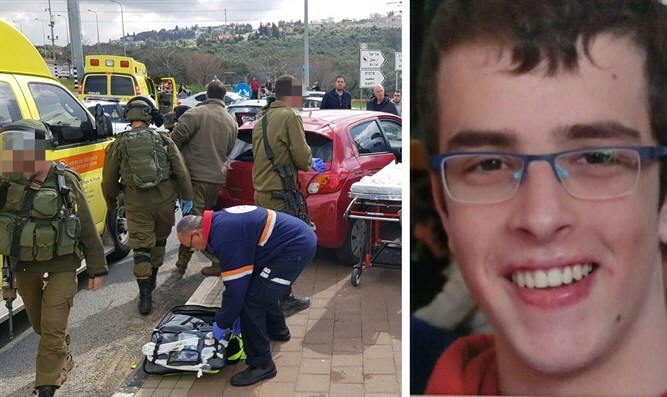 Terrorist who murdered soldier, wounded two Israelis was shot and wounded during attack - but managed to escape. The terrorist responsible for a pair of attacks in Samaria on Sunday, including a fatal attack at Ariel Junction, was shot and wounded during the rampage, yet managed to escape, the IDF said Sunday evening. On Sunday morning, a Palestinian Arab terrorist who had been hiding at an illegal Arab shop near the entrance to the Israeli town of Ariel in Samaria approached 19-year-old IDF soldier Gal Keidan and stabbed him. A second soldier standing next to Keidan reportedly did not fire during the attack. The terrorist then took his firearm, shooting Keidan before opening fire at Israeli civilians and security personnel at the junction, then drove away in a stolen car and shooting another IDF soldier several miles west of Ariel. According to a preliminary investigation by the Israeli military, during the initial attack at Ariel Junction, the commander of the unit deployed to the junction managed to open fire on the terrorist during the attack, and even wounded him. It appears, however, that the terrorist’s wounds were light, and he managed to flee the scene, continuing his rampage after driving to Gitai Avisar Junction. The terrorist escaped in a car which had been abandoned after the terrorist opened fire at the vehicle’s driver. The IDF is continuing its investigation into the attacks, probing several open questions, including why the soldier who had been standing next to Keidan did not open fire at any point during the attack. Also, IDF investigators are probing why the unit which had been deployed at Ariel Junction did not notify the soldiers at Gitai Avisar Junction of the attack or warn them to be on the lookout for the terrorist. Israeli security personnel are continuing their searches for the terrorist, who remains at large.